The Heffelfinger Fountain, located within the Rose Garden at Lake Harriet, was repaired thanks to MPRB and EHFNA efforts and funds. 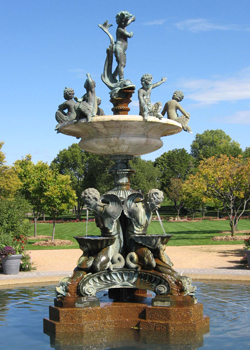 The fountain was purchased from an Italian villa by Frank Heffelfinger and in 1944 donated by him to the Minneapolis parks (see photo). Since then it has been a focal point of visitors' enjoyment of the gardens, serving as the backdrop for countless weddings and the inspiration for numerous artworks. The fountain is a highlight in our remarkable park system. The fountain has been declining and in 2012, the MPRB agreed to repair the mechanical aspects of the fountain. The MPRB hired a fountain engineer to dismantle the sculpture and re-plumb the inside. In addition, the MPRB needed to remove plumbing underground, a source of iron rust deposits which disfigure and damage the sculpture.